I’m really excited to share a new skincare product with you all, I recently got to try. Over the last few years, sunscreen has become very important to me. I know, I know, it should have always been important but truthfully it wasn’t. As a teenager and woman in her 20’s, I was always chasing the sun. I still do, I’m just safer about it now. In my late 20’s the ugly dreaded sun spots started popping up on my face, and after that, I’ve become religious about applying my sunscreen daily and wearing a hat when I know I will be in the sun for awhile. Over the last 5 years or so, being a beauty blogger, I’ve got to try lots and lots of different sunscreens. I’ve become incredibly picky because I know there are lots of sunscreens out there but while most do the job, some of them clog pores, are hard to rub in, or otherwise just feel too heavy and cakey on the skin. While I’ve found a few brands I love, I have only ever tried sunscreens in the form of a moisturizer. 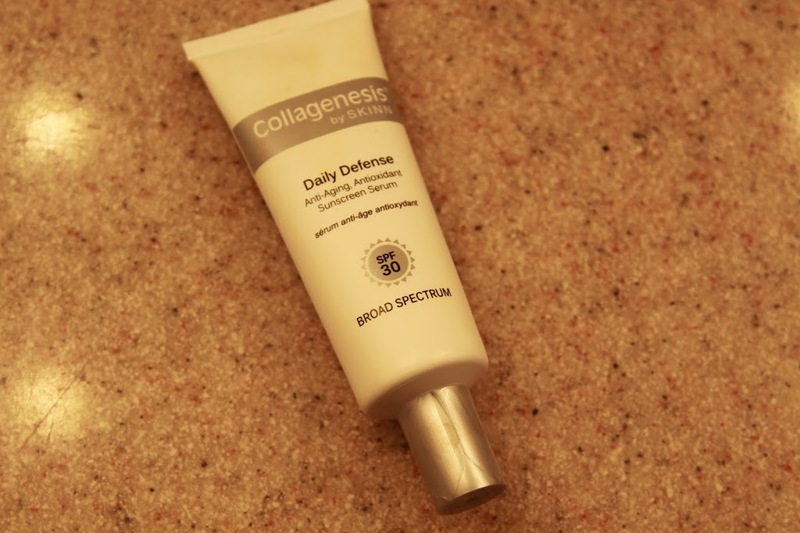 In fact, I didn’t even know you could get a sunscreen in serum form until I came across the Collagenesis by Skinn Daily Defense Anti-Aging, Antioxidant Sunscreen Serum. Not only is this sunscreen in the form of a lightweight, super easy-to-rub-in serum, but you also get lots of great anti-aging benefits with it too! When I got my SPF serum to try, I loved that it indeed feels just like a serum, instead of a heavy moisturizer. I actually found it moisturizing enough that I didn’t even need a moisturizer while using this serum over the last few weeks as well. Besides wonderful sun protecting benefits, you will also get long term moisturization from this serum as well as vitamins A, C, and E to protect against free radical damage. You will also find Oat Beta-Glucan in this serum, which is known for being a powerful natural ingredient that soothes previously damaged skin while also protecting the skin from further damage. The serum is fragrance free and safe for all skin types. I love that it’s super easy to use, feels lightweight, and my skin absorbs it so quickly! That is absolutely amazing for any SPF product! I’m completely obsessed with the Collagenesis by Skinn SPF Serum and I know you will be too after you give it a try! For only $35, you can’t go wrong! If you would like to learn more about this wonderful SPF serum, or pick some up for yourself, then be sure to check out Skinn.com today! 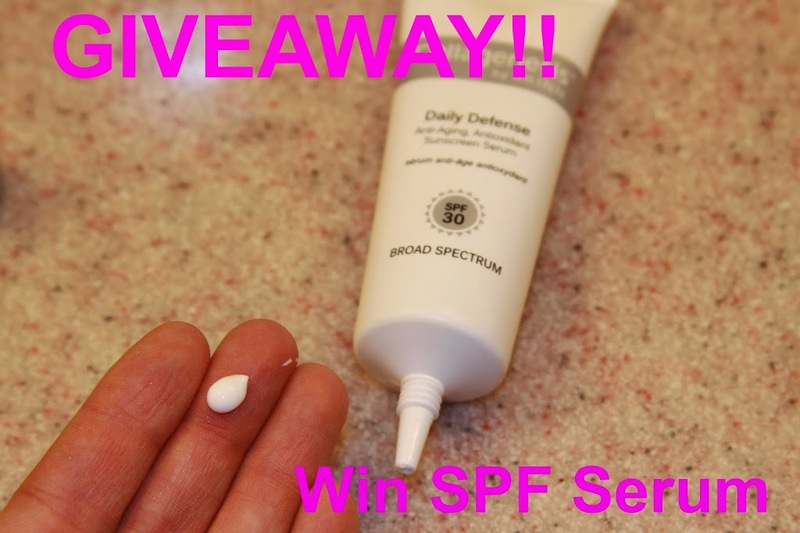 ENTER TO WIN Daily Defense Anti-Aging SPF Serum in the rafflecopter form below! This contest is OPEN TO US AND CANADA. I try to wear SPF everyday, especially on my face! i usually where it whenever i need to go outside and i know i will staying out long. I wear spf everyday in my moisturizer.